Nicki Goff: Teacher, gardener, author, painter – following my heart and expanding my awareness. Quinoa (keen-wah) has its origins in the high upper Andes. The Incas credited quinoa with medicinal and magical properties, and held the crop to be sacred, referred to quinoa as "chisaya mama" or "mother of all grains". The Inca emperor would traditionally sow the first seeds of the season using 'golden implements'. It has been in continuous cultivation in Colombia. Ecuador. Peru, Bolivia. Chile and Argentina for over 6000 years. Both the seeds and the young leaves can be used as food. During the European conquest of South America quinoa was scorned by the Spanish colonists as "food for Indians," and its cultivation and use was actively suppressed, due to its status within indigenous ceremonies. Today, it is returning to commercial favor as a grain in these countries, although it still shares first place with corn as the primary indigenous grain. 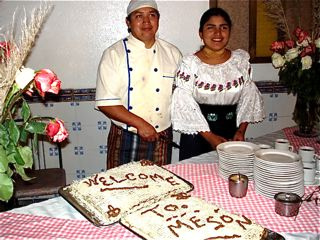 In 'El Meson de las Flores', a small hotel in Cotacachi, Ecuador, the chef, Santiago, is constantly testing and creating new dishes with quinoa. He now appears on local tv in Ecuador, promoting the use of quinoa and other traditional foods. I've been fortunate to be the tester for some of his cookie, cake and empanada recipes, and they are delicious! Chef Santiago serving a quinoa cake…sweet and delicious but protein filled. Quinoa is close to being a perfect food source in the balance of nutrition it provides. 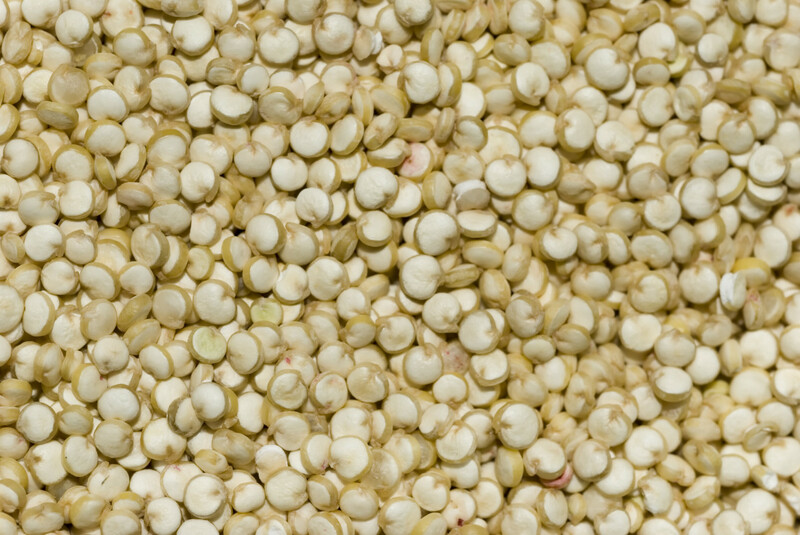 Not a grain but a seed, quinoa is related to the leafy vegetables, swiss chard and spinach. Quinoa is an excellent source of protein - 12% to 18%, one of the best sources of complete protein in the vegetable kingdom. Quinoa is a source of all essential amino acids, including the amino acid lysine which helps the body produce protein. Lysine also helps the body process the protein in the quinoa and in other foods. The World Health Organization has rated the quality of protein in quinoa to be equivalent or superior to that found in milk products. Quinoa is a great source of B vitamins, potassium and riboflavin. It's also a good source of zinc, copper, manganese, magnesium, folic acid, vitamin E and fiber. 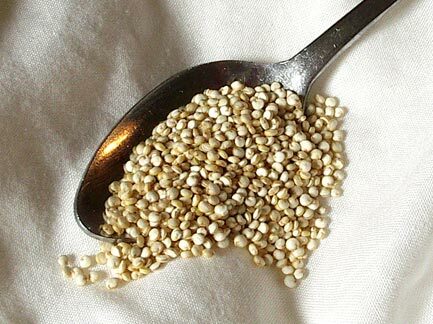 In its natural state, the quinoa seed has a bitter coating of saponins that must be removed before it can be used as a food. This coating evolved to discourage birds from devouring the seeds. Quinoa thrives in areas with poor or alkaline soil, and in areas up to 4000 metres above sea level. Because it is cold tolerant, it is now a valuable alternate crop in Western Canada, Colorado and Scandinavia. Quinoa is very easy to prepare. The coating is easily removed by soaking or thoroughly rinsing the seeds in running water. 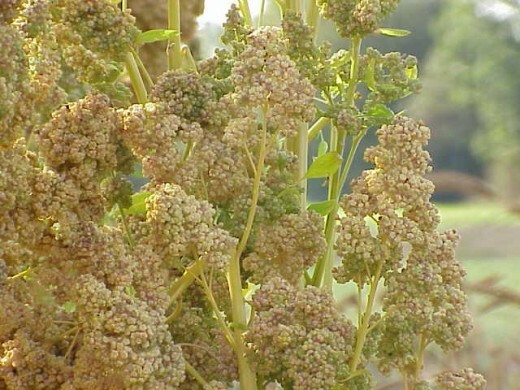 Most quinoa available in North American markets has been pre-washed to remove the saponin coating. Quinoa is cooked much like rice - 2 cups of water to 1 cup of quinoa, simmered for about 15 minutes. 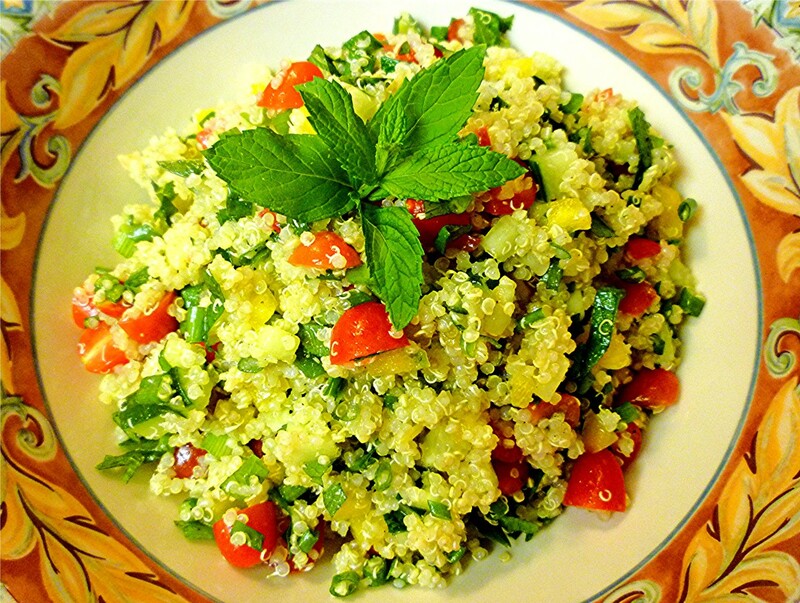 This cooked quinoa can be mixed with vegetables and herbs in a variety of ways. 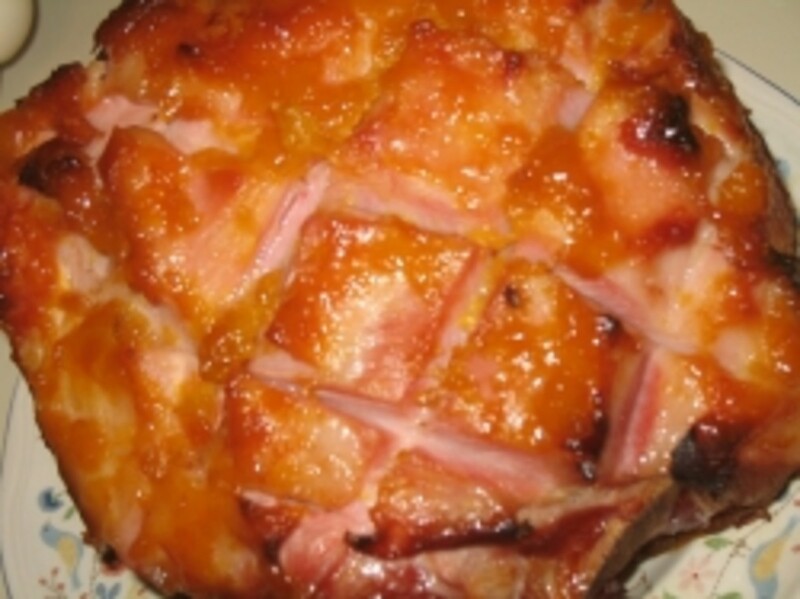 It can also be cooked in chicken or vegetable broth for extra flavor. Mixed with a bit of cinnamon and sugar, honey, nuts or berries, it makes a delicious high-protein breakfast. Use it in salads in place of rice or pasta. Quinoa is also ground into flour, which can be used in wheat-based or gluten-free baking, and quinoa pasta is available. This is my all-time favourite quinoa recipe. 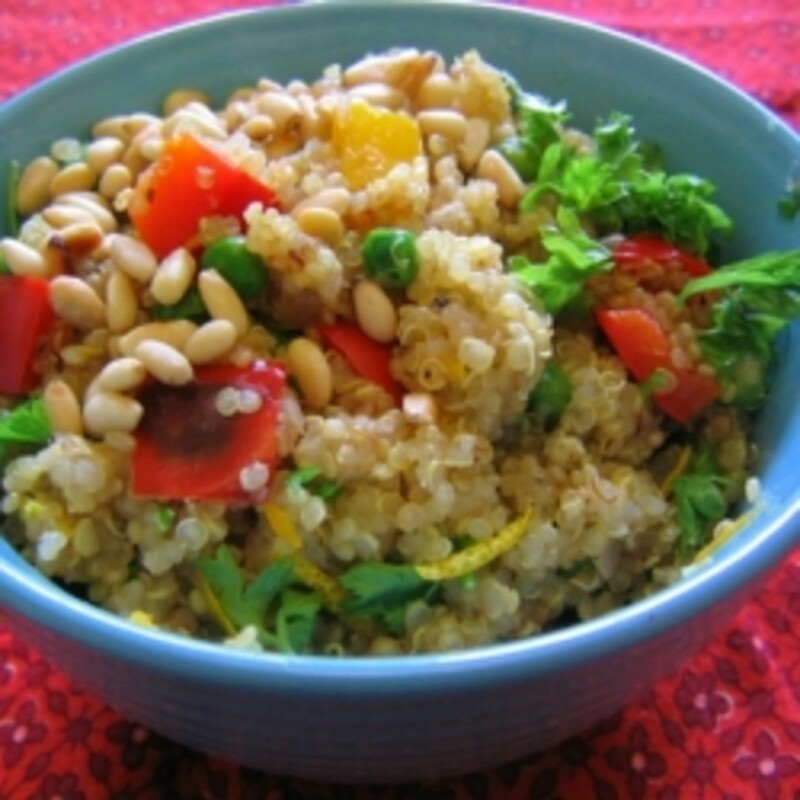 It was the first quinoa salad I ever made, and it still gets rave reviews whenever I serve it. 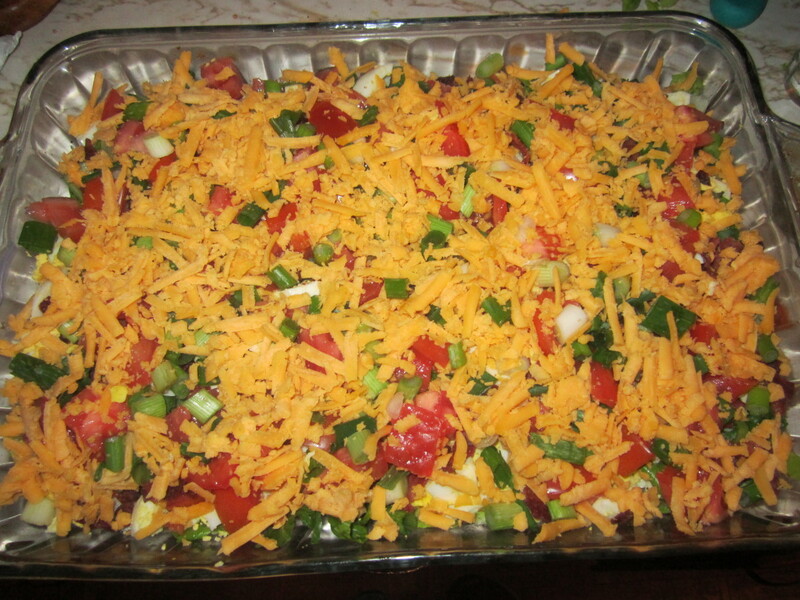 Serves 4 as a side dish or 2 as a main dish. Wash quinoa and boil in water for 10 minutes, Let sit until quinoa absorbs all the water. Fluff with a fork and let it cool to room temperature. Peel the mango and cut into cubes. Dice the cucumber, and add to mango along with the almonds and pumpkin seeds. To make the dressing, heat Ghee in a small pan and fry with turmeric for 30 seconds, then let it cool. Add the lemon or lime juice. Mix in olive oil, cilantro, salt and pepper. Add the cooled quinoa to the mango mixture, pour the dressing over the salad, and toss. Place Quinoa in a medium-sized pan, add the water, and bring to a boil. Reduce the heat to medium-low and simmer, covered, until the liquid is absorbed, 12 to 15 minutes. The Quinoa should be translucent. Remove from heat and fluff it with a fork. Transfer the Quinoa to a large bowl and cool to room temperature. Sprinkle the quinoa with the salt and pepper and stir, folding from underneath the grains. Fold in 4 tablespoons of the lemon juice and the oil. Gently fold in the cilantro and garlic. Toss the avocado with remaining tablespoon of lemon juice to prevent discoloration. Fold the corn, onion, tomatoes, cucumbers and avocado into the Quinoa. Adjust the seasonings to taste. Serve at room temperature within 2 hours of preparation. Serves 8 to 10. Stir in dry ingredients. Shape into small balls and place on a greased baking sheet about 3 inches apart. Press ½ inch thick with floured fork. Bake in preheated 350 oven for 12 to 15 minutes or until nicely browned. Makes 3-4 dozen cookies. Northern Quinoa Corp, located in Kamsak Sask. is a processer and distributor of organic and non-organic quinoa, quinoa products and other grains. Visit the site for recipes and Online Store.